Is my Nvidia Prime working correctly? I am wanting to know if my dGPU is set up correctly? I have been setting up a new Mi Notebook Pro 15.6 i7 laptop. I have been able to successfully install Antergos with Systemd, and have installed the Nvidia Proprietary drivers. This system uses a Nvidia MX150 GPU & the iGPU in the i7. Your OpenGL renderer is the NVidia card, so theoretically. Check the NVidia X Settings app, and make sure it’s saying that you’re using the NVidia card to be sure but it looks ok.
You can also try running the Heaven benchmark if you want to try it in a known/controlled setting. On Medium settings at 1920x1080, it gets about 7-10fps on the Intel HD 620 graphics card (that’s what my laptop has, when I’m not using the eGPU). If you get significantly more than that, you know for sure. 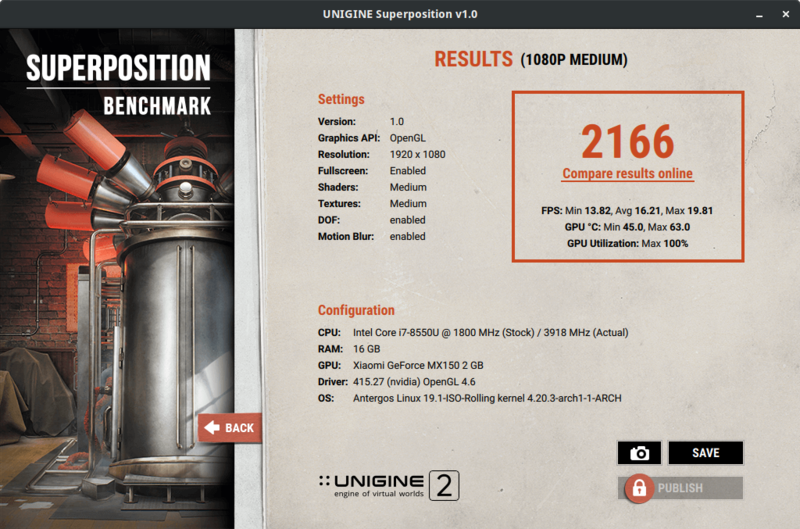 I ran Superposition, which gave about 17fps. Not sure if that is good for MX150 on medium settings. The thing is that I am not running any switching currently. I only installed the Nvidia Drivers. When I have tried to get switching working I end up with a black screen. The screenshot identifies your graphics card as an NVidia MX150. I think you’re good. DRI_PRIME=1 glxinfo | grep "OpenGL renderer"